A small group of protesters gather outside of the ICE building in Center City on July 18, 2018. About two dozen protesters banged drums and chanted near the Immigration and Customs Enforcement office in Center City Wednesday morning, two weeks after Philadelphia police raided and destroyed an "Occupy ICE" encampment set up at the same location, before marching to the new around-the-clock demonstration site activists have established at City Hall. 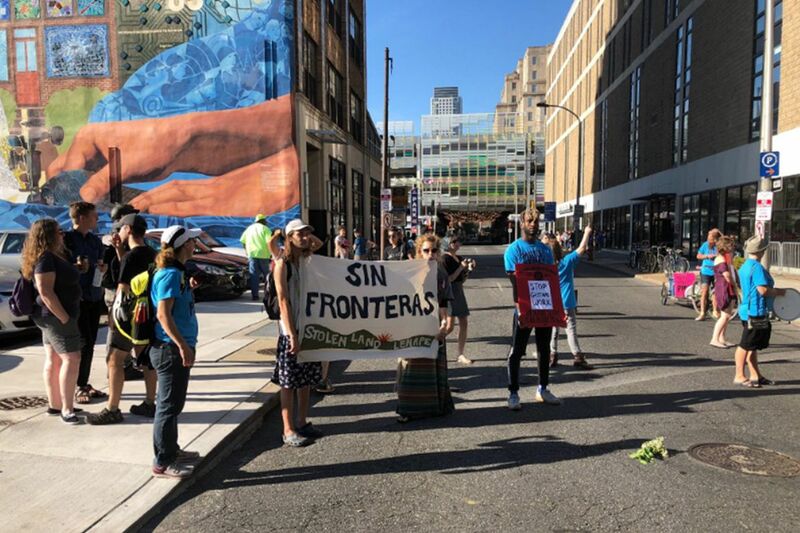 Activists chanted "Abolish ICE" and "Shut down Berks" during a protest at Eighth and Cherry Streets that blocked traffic and lasted for about 45 minutes before they marched past the ICE office and weaved their way through Chinatown on their way to City Hall. Berks is a reference to a federal family detention center in Berks County. >> READ MORE: What is Immigration and Customs Enforcement, an agency now under fire? Some wore turquoise T-shirts that read, "Mayor Kenney End PARS," a call to abandon the city's data-sharing agreement with ICE. The Occupy ICE encampment at City Hall after a group of activists marched from ICE’s Philadelphia office near Eighth and Cherry Streets, through Chinatown, to City Hall on Wednesday morning. "I don't think we're going to get a noise complaint, c'mon you all," one chant leader shouted through a bullhorn when the noise level appeared to fall off. "Immigrants are under attack, what do we do?" she shouted. "Stand up and fight back!" the protesters yelled back. Except for the blockage of Eighth Street during the protest there, the march disrupted traffic at intersections in the area only for short periods. "There are more cops than protesters," one bystander said as the noisy group made the turn onto Market Street from 11th Street. Philadelphia police officers on bicycles and on foot followed the march Wednesday, while police cars blocked traffic at some intersections. "Occupy ICE" protesters have set up themselves outside City Hall in recent weeks after bicycle cops forcibly removed them from their location near the office building on July 5. The group had set up tents and canopies days prior as part of a nation-wide call to abolish ICE. A march organizer, who would identify herself as Debra, said Wednesday's protest was the first time Occupy ICE members had returned to the ICE offices since July 5. The marchers were greeted with cheers from their fellow protesters when they arrived at City Hall.